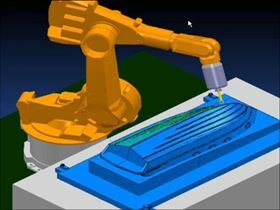 Delcam's IMTS presentation will cover the use of robots for composites machining. In a presentation on 14 September, Delcam’s Brett Hopkins will show how modern machining and inspection software can help companies that manufacture composite components to maximise their profitability. Potential benefits covered include increased productivity, higher quality and shorter lead times. The presentation will also highlight new methods for finish machining that can be used for all types of composite applications, from small components for the autosport industry to large structures for marine or aerospace applications. Although IMTS focuses mainly on machining of metals, Hopkins expects a good audience for his presentation. “The changing patterns in materials use, especially in the aerospace industry, offer both threats and opportunities to component manufacturers and the toolmakers that support them,” he claims. Many composite components are still made to approximate sizes and are then trimmed manually to their final size during assembly. This process is time consuming and inaccurate. Delcam believes that composite manufacturers must be able to produce parts to the same levels of accuracy and consistency as suppliers of metal components before the materials can hope to achieve their true market potential. Delcam's CADCAM software can help meet these objectives.